Painter, art teacher and elder brother of Ronald Horton studied at Brighton School of Art on a scholarship between 1912 and 1916, passing the Department of Education drawing examination with a distinction in 1914. Painter, art teacher and elder brother of Ronald HORTON studied at Brighton School of Art on a scholarship between 1912 and 1916, passing the Department of Education drawing examination with a distinction in 1914. He taught in a number of institution such as the Royal College of Art and the Ruskin School of Drawing at Oxford where he was Master of Drawing (1949-1964). His work is in a number of public collections including the Tate, the Imperial War Museum, the National Portrait Gallery and Brighton Museum & Art Gallery. 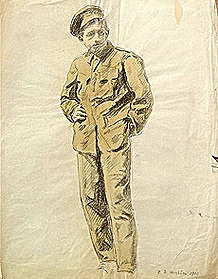 Percy Horton was highly politicised from an early age, joining the Labour Party in 1913 and the No-Conscription Fellowship on the introduction of conscription in 1916 at the height of the First World War. His subsequent refusal to participate in the war effort led to two years of hard labour in Calton Prison, Edinburgh. After the War he resumed his artistic education at the Central School of Arts & Crafts, London, (1919-20), being influenced by the work of Cézanne which he had seen in the ‘Modern French Painting’ exhibition at the Mansard Exhibition, London in 1919. Following a brief interlude as assistant art teacher at Rugby School he returned to the Central to study painting full-time. He went on to the Royal College of Art with a Royal Exhibition (1922-24), studying under Henry Moore, Eric Ravilious and Edward Bawden and gaining a distinction for his diploma work in painting. After a five-year period as part-time drawing maser at Bishop’s Stortford College and the Working Men’s College, London, he was invited in 1930 by William Rothenstein, Rector of the RCA, to become a member of the teaching staff and remained there until 1949. During the 1930s Horton painted a number of portraits of the unemployed, maintaining his political interests by joining, and exhibiting regularly at, the Artists’ International Association, established in 1933). He became a member of the AIA Advisory Council in 1941, the year in which he also began serving on the Council of the Central Institute of Art & Design (established 1939). During the Second World War the Royal College was evacuated to Ambleside in the Lake District, the countryside and its inhabitants inspiring a number of Horton’s paintings. Landscape was to become a feature of much of his mature work that portrayed the scenes from the South Downs, Dulwich and Provence. Also during the War years the War Artists Advisory Committee, chaired by Sir Kenneth Clark, invited him to undertake specific works such as the painting Blind Workers in a Birmingham Factory (c.1942). Horton was elected as Master of Drawing at the Ruskin School of Drawing in 1949 where he remained until 1964, producing many portraits of leading Oxford figures including Roger Bannister to mark his achievement of the sub four minute mile. Following his retirement Horton still maintained a contact with education through part-time posts at Hastings School of Art and the Sir John Cass School, London. Scarfe was a member of the Society of Mural Painters and a Fellow of the Society of Industrial Artist and Designers. Internationally celebrated for his paintings, Professor Jackowski explores images of dispossession, loss and identity. Polly Dunbar graduated from the University of Brighton Faculty of Arts with a Illustration BA(Hons) in 1999. Alan Davie CBE was a painter, poet, jazz musician and jewellery designer. He worked as visitng professor of painting at Brighton for over 25 years. Artist curator Michelle Walker combines work as a freelance art editor for Dorling Kindersley Publishers, London with her textile practice. Neiland at the University of Brighton. Artist and honorary Fellow of the University of Brighton, Professor Henderson was a student of Brighton School of Art. Book illustrator, painter and sculptor Juliet Kepes studied at Brighton School in the later 1930s. Ronald Horton was an artist, collector and highly successful Head of the Art Teacher Training Department at Brighton College of Art from 1944 to 1966. Louis Ginnett (1875-1946) taught at Brighton School of Art and was a painter primarily of portraits and interiors. Printmaker Harvey Daniels was a founder member of the Printmakers Council and fellow of the Royal Society of Painters and Printmakers.